the full description of the dataset. It's not rendering correctly at all: it's being parsed as a return value name. You're talking about this line ? I understood the mistake. Fixing. oops, that's my bad @jnothman thanks for pointing it out. If True, returns ``(data, target)`` instead of a Bunch object. 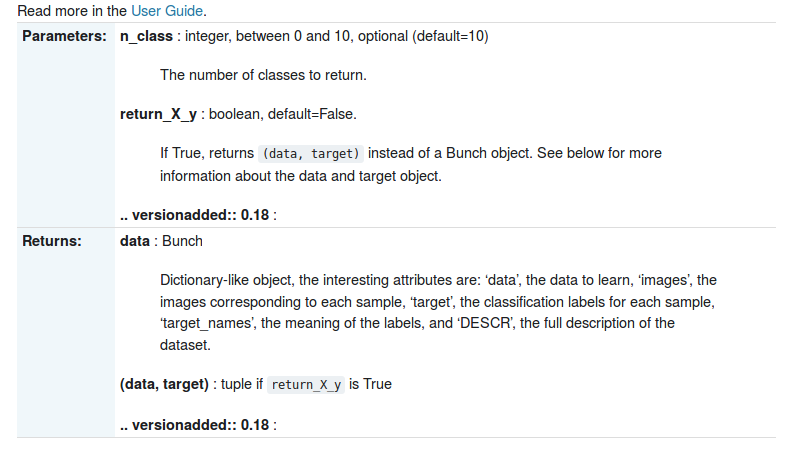 See below for more information about the `data` and `target` object. Similarly, I think this needs indenting to render in the correct place. I think the astype should precede this branching. Even do it right after the file reading block. can you just put the PR numbers together at the end of the dataset listing? I just meant commas between them... But whatever. By `Sebastian Säger`_ and `YenChen Lin`_. should the double quotes extend to after "tuple"...? measurements, as well as 'feature_names' and 'target_names'. looks like it's ok on circle.